Your fish is probably a cross between a regular ocellaris and a Darwin ocellaris. I’m anxious to see if he will change all the way. He was orange 3 months ago. My male has gotten the alot darker on top..
My female she is still very orange.. but has white highlights at the tips of her fins.. I just googled it. and agree. I wonder if the rest of him will turn black. So he may end up looking more like this? I actually prefer the “classic Nemo” but it will be cool to see if he does change more. So, what's the difference? I'm not sure color is very reliable, especially with captive bred clowns that have been artificially selected for certain traits. Looking at fishbase, it looks like you can sometimes tell be dorsal spine counts...but only sometimes. I just read that. He is a baby still so I can’t even begin to count the spines lol. They are too little. 2 of them are really young and the other one isn’t much older. They seem to get along fine. 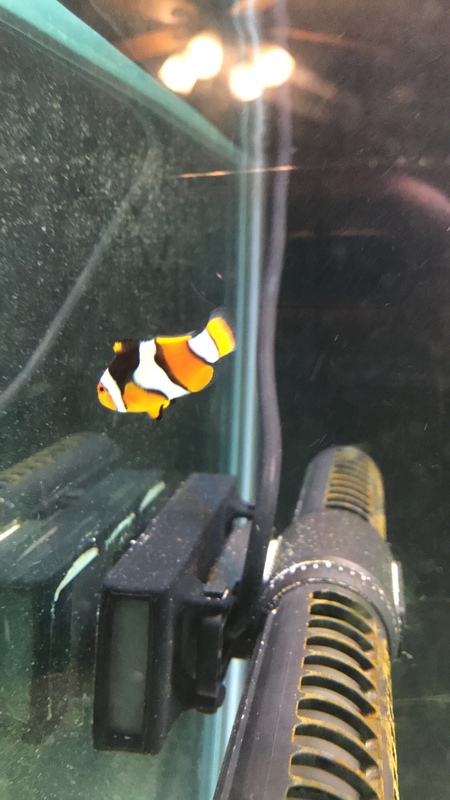 I have a friend that has one tank full of clownfish. He probably has 40 in one tank. Do you say that because of it being an odd number or are you saying that 2 clownfish max is what you should have in a tank? 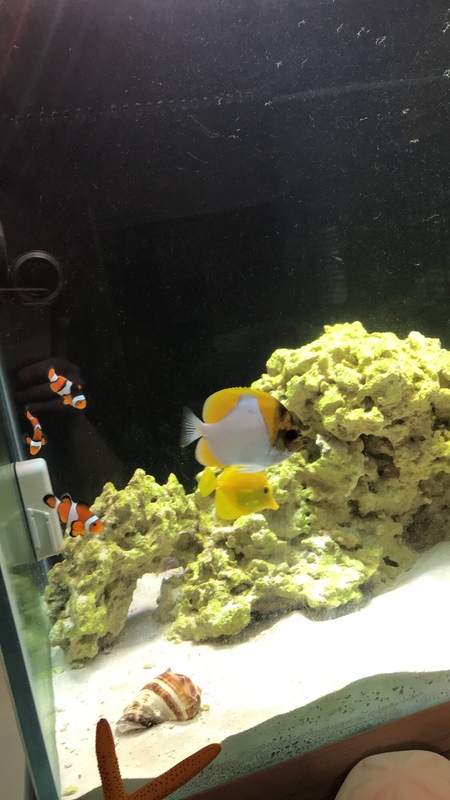 I’m new to this, so I have only gone by what my LFS says and a friend that has 5 saltwater tanks in his house I will watch for aggression though. I think a large group has a better potential of working than 3. Three will not work, at least one will get killed. I'm shocked your LFS said 3 was ok, I think its pretty much common knowledge for those in the industry. It may work for a while, but they will turn and at least one will die. As they get older, yes they may develop more black. Not all are the same patterns though. As far as 3 clowns, like stated above, not a good idea. One will end of dead with the others injured. Never good. Once they become more mature, it will be the largest that will become female, the males will then fight. The female will also become aggressive at first to both males. Two is much more simple. They should pair after a few scuffles and thatll be it. 3 will prolong that process, complicate things, and sadly cause a never ending fight. Mine are almost all black now from getting stung by the corals they force themselves into. I'm not a clownfish guy. After some reading regarding difference between percula and occelaris, it looks like the eyes are the giveaway. Big, black pupils on occ. Percs have orange around the pupil. Nice colour, one of a million variations these days with mix breeding, doubt that will all turn black, not a Darwin clown, they only come from one specific area and all the ones I had only had a little orange in the mouth, this went to complete black in 18 months.